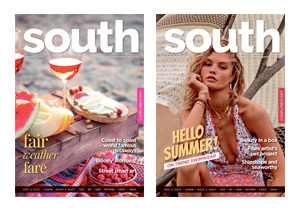 Find out where you can pick up your complimentary copy of the latest SOUTH Magazine below. Welcome to SOUTH an exclusive, monthly lifestyle magazine focused on the good things in life. Read about travel, fashion, health and beauty as well as food, home and gardening, motoring and more. Published by an established company with 40 years industry experience, SOUTH is delivered to suburban Karaka homes and selected Pukekohe suburbs. It is also available from dropboxes in Franklin townships – Pukekohe, Waiuku, Pokeno, Tuakau and Papakura and others. Stimulating and sophisticated, it is designed to stir the senses and to promote a passion for living. Get in touch with SOUTH, we’d love to hear from you.